Energy losses from production processes are often discharged into the air as waste. This means that energy is lost, which could be the source for other processes in the plant. 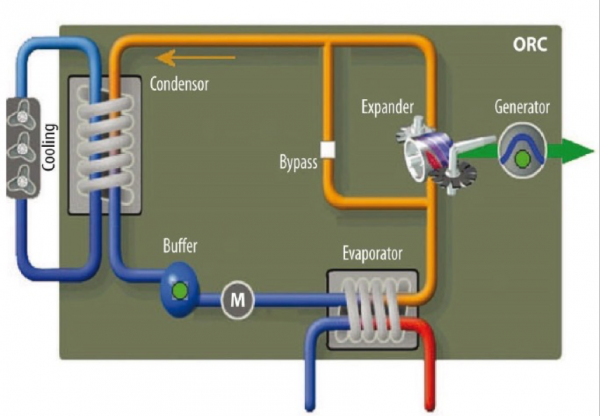 Its use for hot water generation or heating of rooms is already common. Less common is the use of waste heat for the production of electricity. If there the operation has enough waste heat with a temperature of above 80 °C, this heat can be processed by an ORC device, whose power output is ecologically and economically accessible, green electric energy. Elvosolar a.s. offers you turnkey solutions with the implementation of E-Rational ORC units with a power output from 55 kW to 1000 kW. ORC (Organic Rankine Cycle) is a device that produces electric energy from waste heat in the form of hot water, steam or flue gas. It works on a similar principle as steam turbines, but it differs from them in that it uses a heat transfer medium. In this case, it is the refrigerant R245Fa whose evaporation capacity is achieved at temperatures below the boiling point of water. The ORC E-Rational processes heat with a low to medium thermal potential in the temperature range from 80 °C to 150 °C. Waste heat obtained, for example, from the cooling circuit of a cogeneration unit, passes its heat through a plate heat exchanger to the operating medium of the ORC unit. The aggregation state of the heated operating medium changes to high-pressure steam. Subsequently, the saturated steam moves into the expander, which starts to rotate thanks to the steam energy. The expander also starts to rotate an asynchronous generator that produces electric energy and supplies it to the power grid. From the expander, low-pressure steam is distributed to the condenser, where the operating medium is re-liquefied. Subsequently, the liquid is pumped to the exchanger where the cycle ends. The ORC unit uses waste heat to generate electricity and it also enables the power output to be lowered or the emergency cooling coolers to be shut down (these remain connected in the system only for the ORC shutdown emergency mode). Consequently, the ORC unit reduces costs twice –it generates electricity and it also reduces energy consumption that would be required to operate the coolers and pumps of the cooling circuit. 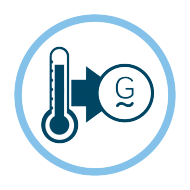 The power outputs of the installed units depend on the parameters of the heat being processed (from the temperature and the amount of available heat). The ORC technology is an ecological and simple way to produce electric energy from waste heat. The attractive payback period of the installation opens up space for a reduction of the energy intensity of manufacturing and energy companies.